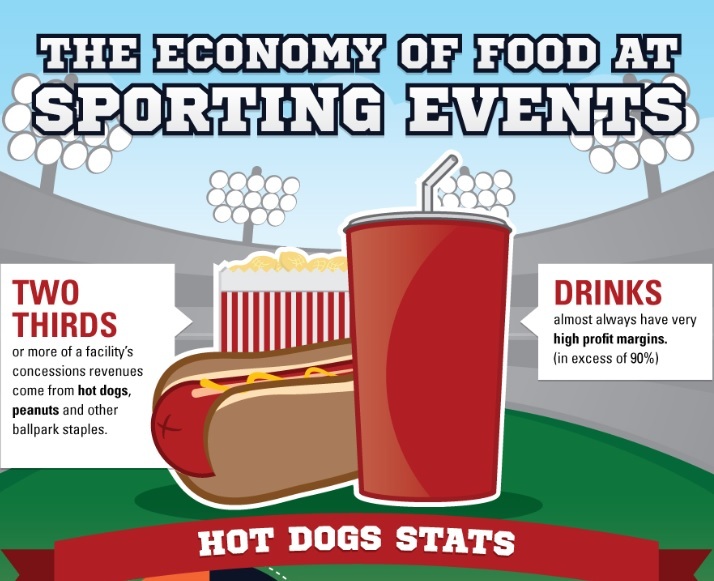 Staples such as hot dogs, peanuts, and beer can still be found at Sporting Events, right along side lobster rolls and corn beef sandwiches - all for a steep price! With stadium fees and the team's take of the profits, the high price of concession stand food at sporting events is the product of complicated negotiations. Two-thirds or more of a facility's total concessions revenues come from hot dogs, peanuts and other ballpark staples. What one ballpark food can you not live without (2008 info)? 80: percentage of fans that have eaten a hot dog at a sporting even in the past year, or will eat one at a sporting event this year. There are 107 North American arenas and stadiums that are home to Major League Baseball, National Football League, National Hockey League and National Basketball Association teams in 2009. - 28: percentage (30 out of 107) of arenas/stadiums with more than half of the concession stands or restaurants cited for at least one "critical" or "major" health violation. - $26 million: two-year contract to provide concessions at the University of Phoenix Stadium. Overall, the Team controls all brands offered at their venue, often directed by the results of fan surveys. 13 of the 30 MLB franchises offered all-you-can-eat seating sections for all or part of the 2008 season.